This is a true fairy tale about Hanna Ahroni, a Yemenite beauty and an extremely talented 12 year old child wonder. She was one of many children in a large but poor family that lived in the rundown neighborhood near the Carmel Market in Tel Aviv. At the time of the establishment of the State of Israel, Hanna started performing on the radio and in concerts gradually becoming a young woman with a unique voice who captured the hearts of Israel with one hit after another. Upon completing her military service Hanna was faced with an accumulation of upsets which caused her to leave Israel and follow her dreams in Europe and in the United States. With the help of her new manager, who later became her husband, Hanna became an accomplished international singer performing on major television shows and in the best venues worldwide. Hanna worked with the top music makers and record companies producing many hits. She was the first artist to record and release the hit song "Viva Espania". However, even though she did visit and perform in Israel, as her international fame grew, back home she was slowly forgotten. And then, sadly, at the height of her international career, Hanna Ahroni, the child wonder with the unique voice that spanned four octaves, decided to give it all up. The films follows the journey of a petite woman with a huge voice who first had to choose between her career in Israel and an international career and later had to choose between keeping a painful silence or revealing the hurtful truth. 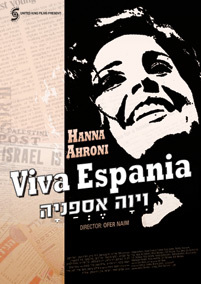 The film, shot on location in Israel and the United States, includes a number of leading figures in the music industry who were involved in Hanna's career.